When you’re sitting and waiting in your doctor’s exam room, are you thinking of yourself as a revolutionary? Victor Montori, MD, wants you to. Dr. Montori, physician and researcher in the science of patient-centered care at the Mayo Clinic, has spent considerable time addressing other physicians and physician groups about the failings of what he calls “industrial health care.” That it fails to notice patients – in the sense of not listening to patients, not understanding nonmedical events in our lives, not paying attention to what we value most. That it standardizes practices for patients like this, rather than caring for this patient. The Patient Revolution is a multidisciplinary team of collaborators with backgrounds in clinical practice, clinical research, design, health policy, and storytelling. The team, which has spent more than 10 years developing tools and programs to help patients and doctors communicate better, have done extensive work in shared decision making and minimally disruptive medicine. The team’s focus right now is on reaching out to individuals at the community level. Currently they are partnering with communities in Minnesota, to co-develop issues around health care access. “It’s still early days,” she noted. It’s said that political campaigns are conducted in poetry, while governance is conducted in prose. The same might be applied to the Patient Revolution. While Dr. Montori may have the soul of a poet, the organization’s website offers very practical prose guidance to help us navigate our conversations with our physicians. What is one nonmedical thing about your life that you think the doctor should know? What is one thing your doctor is asking you to do for your health that is helping you feel better? What is one thing your doctor is asking you to do for your health that feels like a burden or feels harder than it should? Where do you find the most joy in your life? As the late poet, feminist and civil rights activist Audre Lorde wrote, revolution is not a one-time event. But if you’re starting to feel more like a health care revolutionary now, and you want to find ways to advance the movement in your community, you can find ways to get involved at http://patientrevolution.org. You can also order Dr. Montori’s book there. If you were hoping that a 90-minute debate about the health care system would shed some light on what the Federal government could/should/shouldn’t address, going forward, you were in for serious disappointment. On Feb. 7, CNN aired that debate between Sen. Bernie Sanders and Sen. Ted Cruz. It really wasn’t about health care, as much as it was about health insurance. More specifically, it rehashed many of the tired and largely superficial arguments — on both sides — that we’d heard about Obamacare during the 2016 campaign. The one issue Sens. Sanders and Cruz seemed to agree about was that drug costs are too high. If you don’t want to watch the debate for yourself on demand, or read the full transcript (although I’d recommend it), I will sum it up for you: Sen. Sanders believes that health care is a right; that we pay more for health care in the U.S. than other countries and get far less; that drug company executives earn obscenely high salaries; and that there should be Medicare for all. Sen. Cruz believes that government should not be in control of our health care, that it should not get between us and our doctors; that we shouldn’t have rationing the way they do in Europe and Canada; that people should be able to buy health insurance across state lines; and that competition will solve our problems. What they didn’t talk about were some of the fundamental reasons why our health care system is so stressed. Just a few in the realm of elder care: the cost of treatment and caring for people with multiple chronic conditions; the high cost (and reasons behind) hospital readmissions; the challenge of improving care for people in rural areas; the coming wave of aging baby boomers in need of care; the challenge of providing care for people with Alzheimer’s and other dementias; the high cost of surgeries and other treatments for the ill in their last two years of life; the cascade of issues for those in intensive care units (ICUs) through the end of life. Nor did they discuss the possible consequences of doing away with some of the more promising demonstration projects by the Centers for Medicare and Medicaid Services (CMS)’ Innovation Center – authorized by the Affordable Care Act – designed to improve the quality of health care (and containing costs). The two I’d keep an eye on: Independence at Home; and Care Choices. The CNN debate featured a number of real people from various parts of the country and various walks of life, with pressing health care dilemmas and questions for the Senators. You may not be surprised to learn that neither Senator answered those questions directly, but rather treated them as jumping-off points to return to their main messages. Let’s take Sen. Cruz’ colossal misunderstanding, or mischaracterizing, of what palliative care is all about. First, it is all about patient-centered care. That is, it’s about figuring out what’s important to a patient facing serious illness – in simple terms, what does a good day look like to that person? — and helping him or her achieve it. Second, it does that through symptom management, which means alleviating pain, be it physical, emotional or spiritual. Third, it does not interfere with curative treatment the patient might be receiving from other physicians. Fourth, it is appropriate for anyone, of any age, struggling with a serious illness, not necessarily one that is life-limiting. But what about his statement about the intensive care unit? He seemed to be saying that this is a beneficial thing for the elderly facing life-threatening diseases. The reality is that for a frail elder at the close of life, an ICU stay can seem more like an assault than a medical miracle. (If our lawmakers doubt that, I’d advise that they watch the short documentary film Extremis. We may not see much clarity about health care emanating from Washington any time soon. Now that we have a new head of Health and Human Services, will that hasten Obamacare being replaced? Will it be replaced or repaired this year or next year? In what form? Who knows? If this debate was any indication, it doesn’t seem likely that the quality of the discussion about it is going to be terribly enlightening. They say a picture is worth a thousand words. But that phrase was probably invented before the advent of film and video. Recently I watched a remarkable 24-minute short film, “Extremis” (available now on Netflix) and I can tell you unequivocally that it is worth many, many thousands of words. Set in the intensive care unit at Highland Hospital in Oakland, California, it is an unflinching view of dying. More precisely, it shows how the technology that can prolong our lives when we are desperately ill raises important questions about the difficulties in making decisions at the end of life, not only for the ill but also for those who love them and face the agony of impending loss. It’s a relatively short film, but very powerful. I would liken its brevity to the short stories of Alice Munro, who can tell you more about the human condition in 25 pages than most novelists can. The film is the result of a fortuitous collaboration between Dr. Jessica Nutik Zitter, an ICU physician and palliative care specialist who’d thought about the potential impact of a film project ever since she had watched the 2012 documentary “The Waiting Room,” filmed at Highland Hospital; the film director Dan Krauss, who was not initially drawn to the subject of end-of-life issues but ultimately found the ICU to be a “truly fascinating world where science and faith intersect,” as he told Modern Healthcare;” and Highland Hospital. Filming took months. It won Best Short Documentary awards this year from the Tribeca and San Francisco International Film Festivals. “Extremis” mainly follows the wrenching struggles of two families. We meet Donna, in the end stages of a form of muscular dystrophy and on a ventilator, her husband and daughter with her; and Selena, unresponsive after she had stopped breathing in the car on the way to the ER, now on a ventilator too after spending up to 26 minutes without oxygen. We meet her daughter and her brothers, too, each of whom has different beliefs about how to proceed. That these families allowed filmmakers to record them throughout their ordeals is truly remarkable – and a public service. How do we express our own wishes? In the past several years, much has been written about the importance of signing an advance care directive; with it, if you face a medical crisis and cannot speak for yourself, the person you’ve chosen to speak for you would be guided by your wishes and values. And yet, only a small percentage of adults in the U.S. have actually done this. That shouldn’t be surprising; how many of us really want to think long and hard about our own mortality? And how many of us can really envision what it might be like to live on thanks to the many mechanical inventions available to us? Watch this film. You’ll have the clearest view I’ve seen of their reality. Moreover, you’ll see that in the absence of a directive, those closest to you will have the enormous and sometimes guilt-laden burden of making decisions for you, adding to the emotional turmoil that attends the end of life even in the best of circumstances. You’ll also see that decision-making can present moral and ethical dilemmas for the physicians treating you. 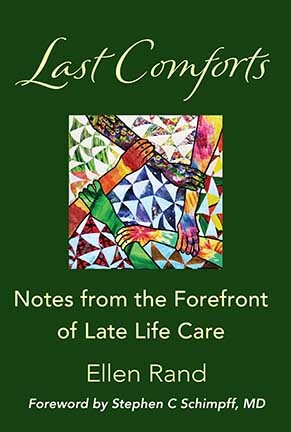 You can find advance directive forms for each state at Caring Connections, a program of the National Hospice and Palliative Care Organization, here.